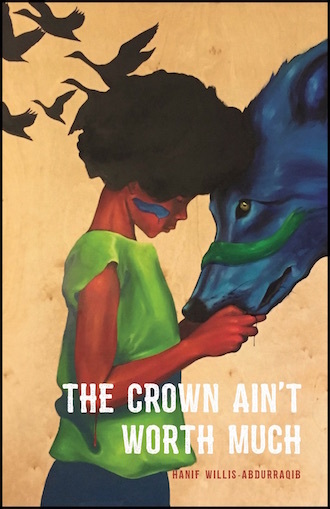 The Crown Ain’t Worth Much is written in blood: the blood of our ancestors, the blood blanketing a screaming newborn, the blood of black boys slain by the state, the warm-blooded boys on the court guarding kicks and gold. When I read this stunning debut collection, I imagined blood seeping through the pages and forming Rorschach blots on the table. Hanif Willis-Abdurraquib is testing us. He knows we haven’t been paying attention. He knows we’re running out of time. This state of breathlessness is a layer of empathy to process—the speaker and other figures in Willis-Abdurraquib’s poems are exasperated at best and gasping in vain at worst, as illness, gunshot wounds, and the clenched fists of the police overtake breathing. I don’t want to quote the last lines of poems in this review but I will mention that many of the poems end on a remarkable note because of the control Willis-Abdurraqib wields over the last image and breath of each work. “September, Just East of the Johnson Park Courts,” “Dispatches from the Black Barbershop, Tony’s Chair. 1996.,” “Windsor Terrace, 1990,” and “I Mean Maybe None of Us Are Actually From Here” are examples of how a final line can make a poem go on forever. The Kanye West reference, coupled with the appearance of ancestors in the first half of the poem, as well as the depiction of the speaker’s grief in the second half, conveys the complexity of black pain and the things black people consume in an effort to overcome pain and take control of a situation. Most of the time, the media depicts black people buying gold and wearing kicks as childish consumers rather than thoughtful patrons. In this poem, there are multiple black perspectives explored. of the wind. how it sounds when being cut by something heavy.